In 2010 the United Nations released a startling report on the trend towards ‘endless cities’, predicting that within 40 years the world’s largest cities will merge into ‘mega-regions’. More than half the world’s people currently live in cities and the report projects future urbanisation as ‘unstoppable’, with 70 per cent of the global population becoming urban by 2050. While the report notes the positive aspect of this trend, that cities are driving economic growth more than nations, it also highlights the negative. Massive urban sprawl on that scale is ‘not only wasteful, it adds to transport costs, increases energy consumption, requires more resources, and causes the loss of prime farmland’. Additionally, cities will be more susceptible to the after-effects of natural disaster and human-made conflict, being more densely packed and bigger than ever before, and still largely underwritten by outmoded infrastructure that has not been designed for such massive and rapid growth. Because of this, there has been a sustained focus on the concept of ‘resilience’ in architecture and urban design as practitioners come to grips with making cities more adaptable in the face of crisis. The discourse surrounding resilience has been keenly felt in the sudden profusion of conferences and events devoted to the theme. In AR 123: The Resilient City, Maitiú Ward, Jo Leeder, Gretchen Wilkins and Alysia Bennett report on four such events, with Wilkins and Bennett applying the lessons learnt to expanded essays on possible urban trends. From Tokyo, Christian Dimmer shares his letter to the Japanese Prime Minister, questioning whether Japanese cities have what it takes to become truly resilient, and Rachel Armstrong introduces a provocative new form of resilient design: ‘living’ architecture. Russell Fortmeyer argues that the in-vogue concept of sustainable high-rise buildings still requires work to make it viable, while David Neustein contends that the term ‘resilience’ is in danger of becoming meaningless, an empty facade hiding unpalatable truths about the ability of architecture to confront real environmental challenges. Lara Strongman takes a similar tack but from a position of painful experience: as a Christchurch resident living through the 2010 and 2011 quakes. The Christchurch quakes have served to focus this edition, and my own impressions of the ruined CBD form the basis of a report on that city’s proposed regeneration. I also interviewed Sir Miles Warren, renowned New Zealand architect, about the post-quake rebuilding process, and spoke to Ash Keating and Dorian Farr about Gardensity, their speculative architectural project critiquing Christchurch’s future. Our project reviews continue the dialogue on resilient design. 1 Bligh Street by Architectus and Ingenhoven Architekten and 500 Bourke Street by John Wardle Architects are genre-busters, proving that large-scale commercial projects can have a positive impact on civic space. In the residential context, Paul Morgan’s Trunk House and Sparks Architects’ Montville House respond sensitively to the natural world, while Charles Wright’s Cairns Botanic Gardens Visitors’ Centre adapts to tricky environmental conditions: the wet tropics. As this is my first full issue as AR editor, I’d like to thank my predecessor Mat Ward for the intellectual and critical rigour he bequeathed the magazine. Mat drew upon the equally impressive work of Andrew Mackenzie before him, and their combined tenures have enriched Australia’s architecture media. I welcome the opportunity to further entrench Architectural Review Australia as a publication of quality and distinction. Click here for a link to more spreads from AR 123. 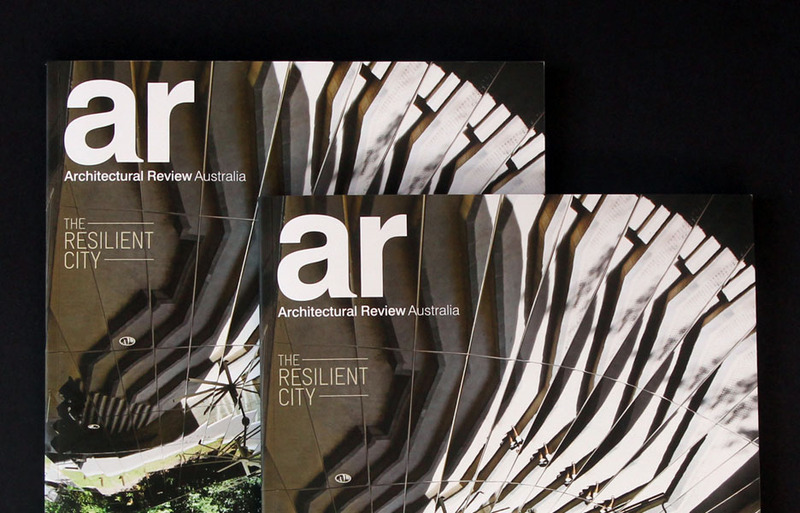 Click here to subscribe to the print edition of Architectural Review Australia.